Air conditioning is a great appliance for keeping the temperature comfortable. You need to make sure you look after the machine to make it work at its best. One scenario you may come across is a frozen air conditioner. It can be a very hot day and you still may find ice on the unit. If the air conditioner is frozen, even in winter and low temperatures, this means there is a problem. A frozen air conditioner is a common problem and it can happen to any unit. We are here to help and discuss how this can happen, what you should do about it and how a technician can help. Air Flow – If the airflow in your unit is restricted this can cause the coil to freeze. Humidity can collect on the coil which results in a freeze when the temperature drops. 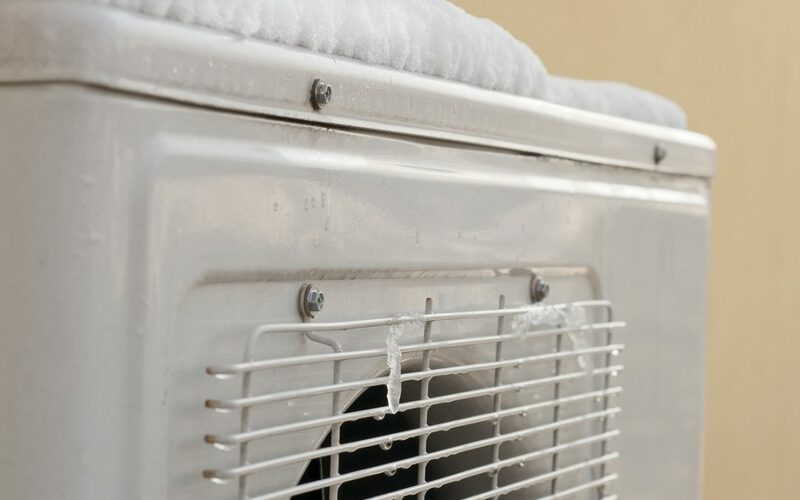 If the coil is frozen the air conditioner won’t work as it should and can cause the whole unit to freeze. Debris can cause restricted air flow as well as collapsed air ducts, dirty filters and motors that have been damaged. Refrigerant – If the refrigerant levels are too low or if it is leaking from the unit this can cause a frozen coil. When the levels are low it causes the unit to be at a low temperature and at this temperature the refrigerant goes into the coil. The moisture on the coil will result in a freeze. Temperature Outdoors – If you have an outdoor air conditioner it can freeze when the temperature outside it too cold. You can have controls put in place to help the air conditioner work in low temperatures. A freeze up can often happen at night when the temperature drops. Short Cycling – Large air conditioners can sometimes not move the air around fast enough which can cause the unit to short cycle so freezing can occur. If you have noticed that your air conditioner is frozen then you should turn it off immediately. If you keep the conditioner on while frozen it can damage the unit so it will be costlier to fix. There may be an obvious cause which you can see when the unit has thawed. However, if this occurs keep the machine switched off and call a technician. You can test the machine after it has thawed to see if it is working. After it has thawed turn the machine back on and you can feel if there is air blowing out of the vents. If you notice it isn’t working properly then turn the machine off and call a qualified technician. If your air conditioner has frozen over then you should call a technician. A technician can take care of your air conditioning repairs. They can change the filter, repair any issues, check the refrigerant levels and check for leaks. There is advice around on how to do some of these things yourself, but we recommend calling a technician. They can spot the problem and fix it efficiently. Fixing it yourself could lead to more damage and more expense. You can avoid freezing of your air conditioner with regular maintenance. A technician can clean and change filters, check the thermostat, can check the refrigerant and can inspect the coils. Regular maintenance will avoid this issue and more. If your ac unit isn’t cooling the way you want it to then contact Apex Airconditioning today!